» What Do Squirrels Like To Eat? What Do Squirrels Like To Eat? Squirrels are very practical little creatures and they will eat many types of things in order to survive. Needless to say, however, squirrels have their preferences. When it comes to favorite snacks and treats, a few options come to mind. 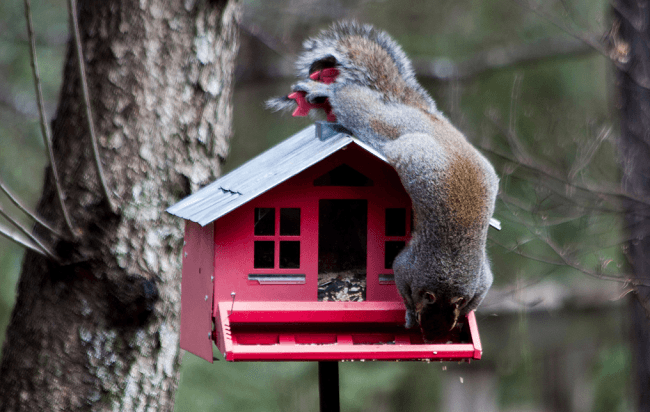 Would you like to start feeding squirrels or maybe you’re wondering how to protect your garden from their raids? If so, it’s a good idea to learn a bit more about what squirrels like to eat. Fruits and veggies ranks among the absolute favorites for squirrels. These are the main reasons why they’re often seen in gardens and why some farmers consider the furry rodents to be a major pest. Fruits are one of the food types that squirrels enjoy the most. If you have a fruit tree, you probably know that squirrels would sometimes pick the fruits directly from the branches instead of waiting for those to fall off. Squirrels like an amazingly big range of fruits. Apples, prunes, oranges, kiwis, grapes, pears, nectarines, figs, peaches, plums and mangoes are all fruit varieties that you can feed to squirrels. Very often, squirrels will eat bananas, strawberries, cantaloupes and various other types of fruits. You may want to experiment with different fruits in the squirrel feeder, until you discover the ones that your garden visitors like the most. The situation is similar with veggies. A variety of vegetables will draw squirrels to gardens, which can potentially lead to problems. Green leafy vegetables are particularly vulnerable. In addition, squirrels may taste your tomatoes, squash, radishes, beans, okra, eggplants, cabbage, asparagus and cauliflowers. You get the picture – there are very few types of fruits and veggies that squirrels are going to turn down. Obviously, squirrels adore nuts. This is a fact about the rodents that even kids are familiar with. Nuts are a safe bet when you have no idea if a squirrel is going to eat another type of food. If you have a nut tree in your garden like an almond or a walnut, for example, you know that squirrels simply can’t resist it. They’ll gather the nuts and store a couple of those in their cheek pockets. 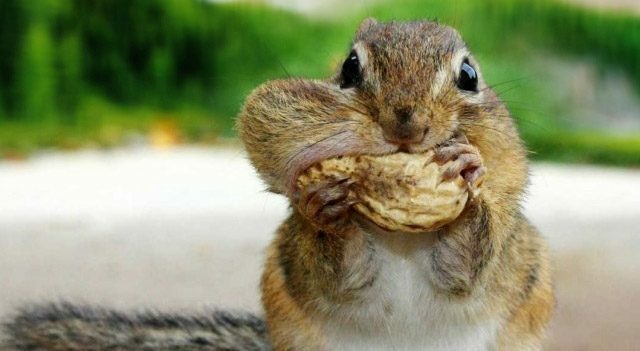 The cheeks of squirrels are covered in a membrane that can expand, allowing them to carry a few nuts with them. Squirrels are notorious nut hoarders. They collect large quantities of acorns, almonds, walnuts and other types of nuts they can find. These will either be buried in the ground or stored in a tree hole. The nuts that squirrels collect during the summer and autumn will then be used as food during the cold winter. If you have hazelnuts, pistachios or almonds in your garden, it’s a good idea to set up a squirrel feeder. Otherwise, it will be pretty difficult to protect the tree and enjoy the delicious nuts yourself. The three types of foods mentioned already are the absolute favorites of squirrels. Still, there are several other products that the little rodents will enjoy. Many people say that they feed squirrels in their garden with cereals. Many cereal varieties consist of grain and nut mixes. This is one of the main reasons why squirrels will typically enjoy the morning treat and have it a couple of times per day rather than just for breakfast. When other types of foods are difficult to find, squirrels try to do with what’s available. Squirrels are seen as hunters and gatherers. This means that upon necessity, they can kill other small animals in order to survive. Sometimes, squirrels will consume insects, small birds, larvae and small invertebrates. They aren’t typically carnivorous but survival knows no limits. Squirrels are also known for stealing bird eggs. Depending on the situation, squirrels may even be daring enough to take eggs from a chicken coop. Squirrels may also consume baby birds or the bodies of young birds that didn’t survive their first days. If you intend to start feeding squirrels, there’s no need to look for specialized products in pet stores. A bag of mixed nuts and seeds will be sufficient to keep squirrels happy. You can diversify their menu with occasional fruit and veggie treats. Squirrels aren’t picky at all and chances are that they’ll enjoy whatever you could spare and put in the feeder.